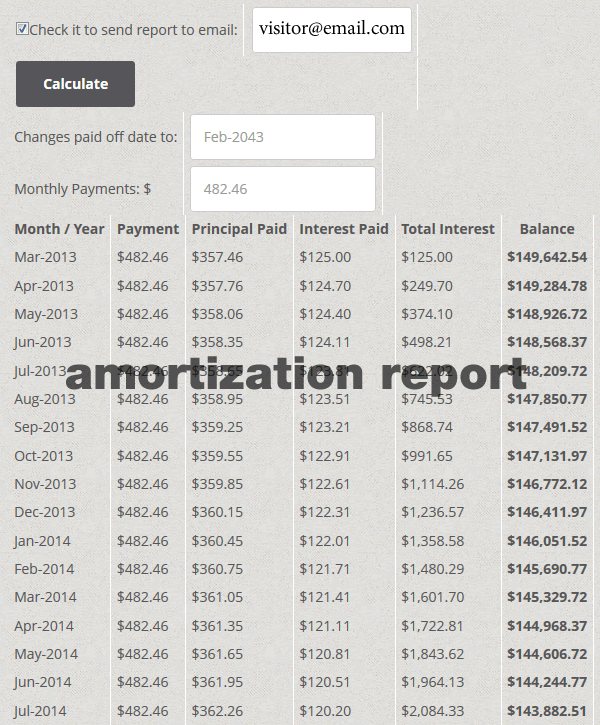 Let your website visitors calculate their payments based upon the interest rates and loan amount entered. Mortgage and Loan Calculator Widget/Plugin is also translate ready, that means you can translate any plugin fields to your preferred language using WPML or qTranslate or just by editing the language files with an editor. One of the most unique features is that it gives the opportunity for your visitors to receive reports on their email account. This is a win win situation because your users will be happy for archiving their reports and will come back for more in order to compare with older ones, while you receive precious stats for later report monetization. They can change any values without reloading page. They can enter “Extra Payments” details although its not required. If your visitors wish they can enable the “Send report to email” option in case they want to have their report sent as an email for later comparison with other reports. After entering all fields select “Calculate” and wait a few seconds for the results to appear. Every time your visitor enables the email report you get results saved in your Wordpress database under table `wp_a_m_c_reports`. You can use that table for exporting reports and other useful data. Plugin uninstall also removes all related tables. 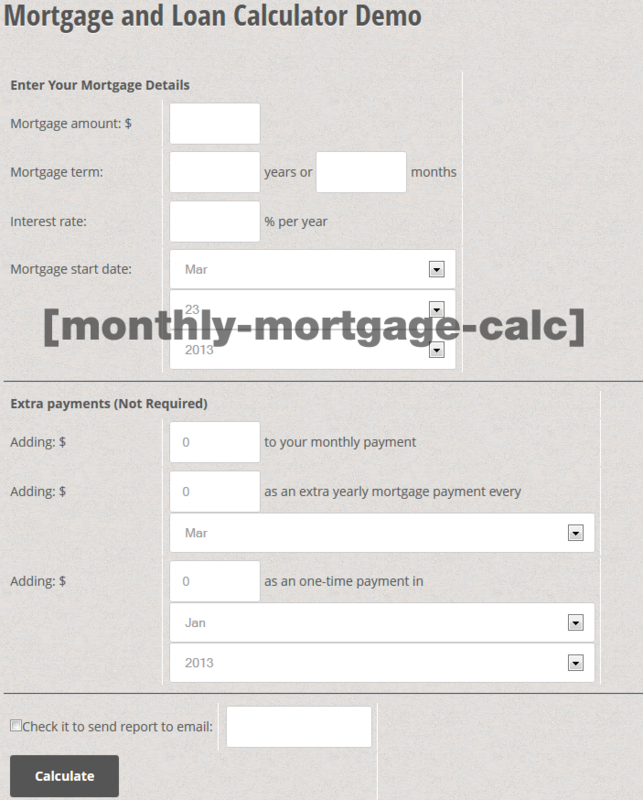 Find and edit file public/mortgage-and-loan-calculator.php with notepad or any other editor. Go to line 292 and 1213 and replace www.wpcream.com with your url then save and close file. Then go to line 298 and 1220 and replace reports@wpcream.com with your own email then save and close file. Go to line 365 and replace the owner url from www.wpcream.com to your own, do the same for line 841. Upload folder under /wp-content/plugins/ through ftp. 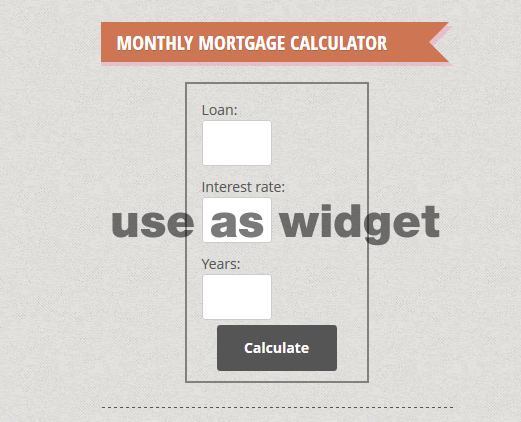 [monthly-mortgage-calc] If you want to use it as a widget just slide the “Monthly Mortgage Calculator” widget to your desired sidebar. Plugin is developed to work and function with the default WP installation, themes and plugins. If you are using plugins and themes(mostly) that don’t follow the WP standards then there is chance that the plugin won’t work as expected unless you adjust your theme or plugin with conflict accordingly. You can request support or send questions and inquiries through the href=”http://codecanyon.net/item/mortgage-and-loan-calculator-plugin-for-wordpress/127569/support/contact”>Support Contact Form. Additional Notes: You can use both plugin and sidebar widget at the same time without any problems. For more Financial Calculators both for Wordpress or php/html scripts take a look at my Portfolio page.